Dave's Beer: Entomologist in Training? Any parent knows how little influence they probably have over their kids' future. Except maybe those overbearing ones that force their kids into med school and then therapy. Secretly, we try anyway. The Mrs and I got over our bug phobia when Frankie was born in an attempt to show her the infinite beauty of our natural surroundings in hopes she may someday become an entomologist. Don't know why we both like this discipline, but it seems like it might be a stimulating and fun way of life. She's beginning to spot many more bugs than we do; part a child's ability to not take their environment for granted. This was an especially good sighting. When she sits still long enough, we're going to try to identify it using What's that Bug. 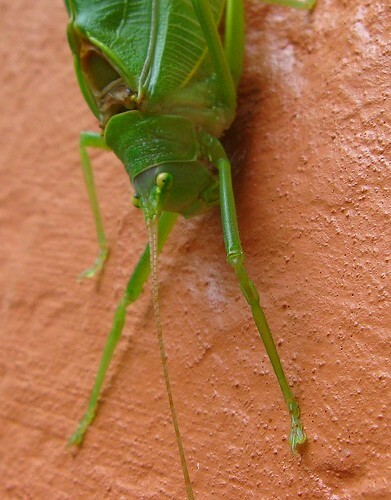 I think it's a katydid too. Did you know they also come in hot pink? Google image pink katydid to see pics of them. Frankie probably would really like a pink one. Thanks Nancy, here's a neat one from flickr. This one was pretty chubby in the body though. Not quite convinced it was a kaydid. I'm still calming her down from the zoo, doing laudry and cooking. We'll check whatsthatbug.com tonight. I would identify that bug, to my children, as "a green bug of some sort." You both sound like such great parents....maybe there will be a book deal in your future. America needs to know how you do it. CBM, I'm blushing. Sometimes I guess we recognize we're saying no too much and let her explore to heart's content. She's good at it. She had an awesome find tonight to but the image isn't quite as good, but it's cool anyway. did you take that picture? fantastic. what kind of camera? Hey Karl, Thanks. It's just a cheap point 'n shoot Canon A570IS. I've been enjoying close-ups lately. Just have to use something to steady it (against your body, bag of beans, tripod - I use 'em all) and the macro setting. Fortunately, most bugs stay still for the preparation.